Approximately 88.6% of the people I know are currently laughing hysterically because I am exactly the type to overthink everything. But the next time we’re watching Scandal on girls’ night in, you can all thank me for the seasoned popcorn and red wine because there’s really nothing better on a Thursday night than Olivia Pope + her fictional favorite snack. But what about books? We don’t always have the luxury of the perfect cozy reading nook or drizzly Sunday mornings on which to enjoy our favorite books. More often than not, I’m reading late at night and hoping my light doesn’t wake anyone else up, or in a bustling college quad filled with rowdy freshmen. Neither of which is conducive to literary immersion. However, while I may not be able to conjure up a grey, lazy morning and a cushy window seat whenever I want, I can take along a little something to complement the mood and setting of any book: an unassuming travel mug filled with the perfect flavor of tea. 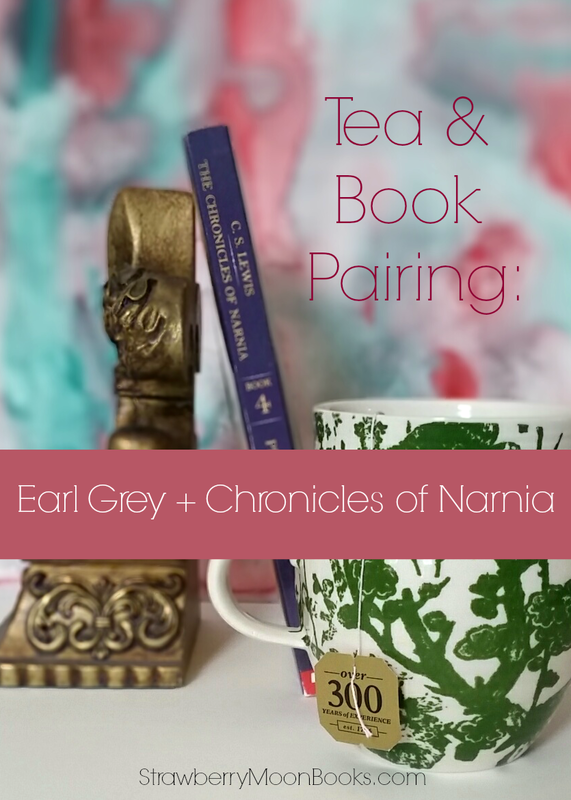 I thought I’d start off with an easy one, my favorite easygoing tea flavor and one of my favorite books: Earl Grey + The Chronicles of Narnia. I pretty much drink Twining’s basic Earl Grey by the buckets. Generally, 3+ cups a day. So it might seem odd to consider this flavor immersive in any way; aren’t I entirely desensitized to its delicious citrusy notes by now? And yet there is something so quintessentially English about both a hot cuppa and C.S. Lewis’ classic series, I can’t imagine pairing Narnia with anything else. The Anglophile in me would never stand for it. Although the reader sees the Pevensies only when they are visiting or about to visit Narnia, the siblings are English through and through. Tea, of course, is an ingrained part of English culture and Lewis leads us to believe this is so in Narnia as well. The first thing Lucy does when she stumbles into Narnia, after all, is be invited to tea by Mr. Tumnus. Earl Grey is the perfect soothing blend to transport you right through the Wardrobe. The bright orange flavors of bergamot, (the main ingredient in Earl Grey), are reminiscent of the warm, sunny Spring that finally comes to Narnia after the White Witch is defeated. At the same time, the classic notes are a reminder that the Pevensies must one day return home to their native England. So raise a cuppa Earl Grey and toast to the Kings and Queens of Old! Oh I totally agree! They are a PERFECT combination. It makes me wish I liked tea because the idea of a wet grey day + Narnia + tea = entirely too fabulous. :’) Thanks for stopping by @ Paper Fury! Thanks! I’m a huge tea drinker because I don’t drink coffee. Planning to do at least a few of these so maybe I’ll hit on one you’ll like at some point. 😉 Thanks for returning the drop in!